The construction plane grid lies on the construction plane. The dark red line represents the construction plane x axis. The dark green line represents the construction plane y axis. The red and green lines meet at the construction plane origin. The color of these lines can be changed. To change the direction and origin of a construction plane, from the menu, use the CPlane command. Preset construction planes: World Top, Right, and Front give you quick access to common construction planes. In addition, you can save and restore named construction planes and import named construction planes from another Rhino file. Coordinate input, elevator mode, object snaps , and other cursor constraints allow the cursor to move away from the construction plane. Construction plane behavior in the viewports is controlled by the Standard and Universal options. With the Standard option, the construction plane of each viewport is independent from all of the other constructions planes. With the Universal option, the behavior of the construction planes in the viewports is linked. Set these in Modeling Aids Options. The construction plane is infinite. 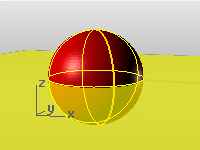 The array of lines lying on a specified portion of the construction plane in the viewport is the grid. The grid is a visual reference only. The size, spacing, and color of the grid lines can be changed. The x and y axes of the construction plane are shown on the grid in color by default. The visibility and color of the grid axes can be changed. Custom construction planes can be named and saved in the 3dm document, They can be restored in any viewport using the NamedCPlane command. Link the viewport origin and position.